First, sorry about the absence. I’ve just been busy lately and on the treadmill at night. It makes for a long day. At any rate, I’m going to throw a salvo of posts at you tonight that will give you a glimpse of what it’s like to live with me, and what Ann has had to deal with since 1993. How she does it is beyond me. Ann is fully aware that I like to pick on her about her penmanship. She’s just the opposite of her mom, who is Palmer Method all the way. One day I saw Ann in the kitchen scribbling our shopping/to do list on a notepad. When she is done I look it over to see if there was anything she might have missed. I stop and get a curious look on my face. Me: What the Hell is a “doglic“? 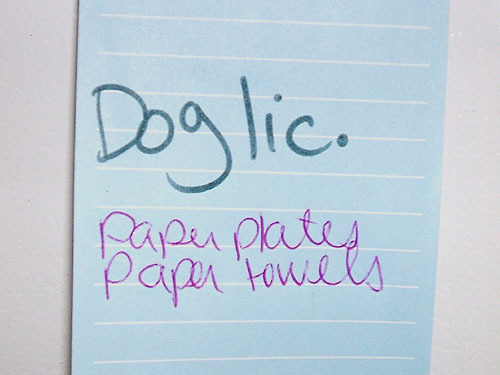 Me: “Doglic”. That’s what it says here (pointing to word). Ann: Oh, the dog’s license. It’s due this month. I stop and stare at the word a bit longer. Me: You know you write funny, right? A few weeks ago we were in the midst of some pretty hefty rainstorms here in southern California. After an overnight drenching, Ann tells me the next morning about what she saw and heard at about 2 a.m.
Ann: Hey, did you hear that noise this morning about 2? Ann: Yeah. Well, you were alseep so you probably didn’t. But I heard this loud humming sound and saw, like, three bright flashes of light outside the window. I mean, they were bright. Ann: Yeah, it was pretty strange. Me: Maybe some lighting struck somewhere or a transformer blew up. Me (thinking): Did you happen to look outside to see if a Delorean went flying down the street? Ann (smirking): No, there was no Delorean out there. Me: Hmm. (shrugs) Well, I’m out of ideas then. The three of us were at a local party/teacher supply store looking for more goodies for The Kid’s 5th birthday party in a few weeks. While crusing the aisles, I came across the Christian school supply section. One item in particular caught my attention so I reached for my phone so that I could take a picture of it. Ann and The Kid approach as I am standing taking the shot. The Jesus Wig and Beard costume. Comes complete with thorny crown!